El Salvador is one of the most violent countries in Central America along with Honduras and Guatemala. Gang violence is a leading cause of violence in the country and it’s estimated that some 60,000-young people have gang affiliation. Gang involvement often offers a sense of belonging and family that counters the lack of education and employment opportunities offered in the country. Close to 35 percent of El Salvador’s population lives in poverty, according to the World Bank. Youth in the country are confronted not only with poverty but with instability, high levels of violence and inadequate access to educational opportunities. Despite ranking high for economic indicators, the need for practical education is more important than ever with 12 percent of youth ages 15 to 24 unemployed and 41 percent underemployed. Salesian missionaries are empowering the youth of El Salvador to create their own opportunities for success now and later in life. Student input, innovation and involvement over the years have resulted in exceptional programs that are enabling children to overcome poverty and realize their full potential. Salesian partnerships with government-funded facilities are further strengthening the positive impact on young people. Don Bosco University, located in San Salvador, is working to provide opportunities for advanced education and employment for disadvantaged youth in El Salvador. Approximately 6,000 students are enrolled at the University which maintains a strong link to the local employment sector through research, technology transfer programs, continuing education courses and consultancy services. Degree programs are offered in engineering, social sciences, humanities, economics, technology and aeronautics, among others. The University’s biomedical engineering program received recognition and five-year accreditation by the Central American Accreditation Agency for Architecture and Engineering. The program is recognized for its academic standards and was evaluated for its curriculum, process of teaching and learning, research and technological advances, and the physical and technological infrastructure that integrates the practical skills of students and specialized teachers. The University is the only institution of higher education in El Salvador that offers a biomedical engineering program which trains professionals in the design, analysis and management of the technologies and systems that contribute, from an engineering perspective, to the improvement of medical applications. In 2014, the Don Bosco University also made significant strides in its aircraft maintenance program. For the first time in the company’s history, FedEx donated a Boeing 727 aircraft to the University. The donation of the plane was coordinated with help from Salesian Missions. The donated plane serves as a hands-on training tool for hundreds of aviation students at Don Bosco University. Students take skills learned in the classroom and apply them while learning about the mechanical aspects of large aircraft. The Don Bosco University also entered into a cooperative agreement with Broward College in Davie, Florida that will further the aviation program at the University. The agreement brought two professors at Broward College, Emilio Lizarraga and Tomás Garrido, both international experts in avionics, to Don Bosco University to aid in the setting up of both theoretical and practical lesson plans to help in program development for the maintenance, servicing and storage of the Boeing 727. In addition, the professors trained 12 individuals, including teachers at the University and staff of the AEROMAN Company and of the El Salvador Air Force, to assist them in familiarizing themselves with the aircraft. Through a remarkable project in San Salvador, youth have turned a garbage dump into successful educational programs — and their futures into one of entrepreneurship and hope. Youth were a driving force in the creation of the Polígono Industrial Don Bosco, a complex that houses 11 cooperative factories that generate $900,000 annually. When Salesian priest Father José Maria Moratalla proposed a technical school be built in a poor neighborhood on the site of a dump, youth suggested building workshops where they could practice a trade right in their community. Today, the idea has grown to include a day care center, a technical school and recreational facilities. Serving at-risk youth from low-income families, the Polígono Industrial Don Bosco has helped mainstream former street children, gang members and juvenile offenders by giving them an education and a stake in the businesses where the older youth work. Young students in the technical school — even the preschoolers — learn that access to jobs and a stake in the business is possible. The Inter-American Development Bank supported the project. In addition to helping build schools, Salesian Missions also helps ensure youth have the funding to attend them. Fifteen youth, aged 12 to 15 who plan to continue their studies in the technical field, were able to attend the Saint Cecilia Salesian High School in 2018 thanks to scholarship funding from Salesian Missions. 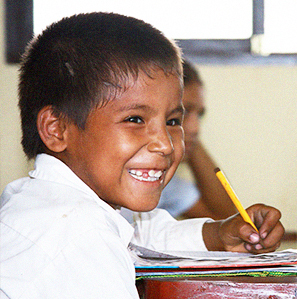 The school, located in Santa Tecla, has a scholarship program designed for children with limited financial resources which continues funding students through their technical high school education. The need for practical education in El Salvador is more important than ever with 12 percent of youth ages 15 to 24 unemployed and 41 percent underemployed, according to the World Bank. According to the U.S. Agency for International Development (USAID), less than 50 percent graduate from the sixth grade, only one out of three students finish the ninth grade, and only one out of five complete high school. In San Salvador, the Don Bosco Worker Technical Institute offers free education and job training to marginalized youth at risk of joining gangs. As an alternative to criminal activity, more than 400 students pursue training in electricity, mechanics, carpentry, welding and tailoring. Another successful program is the Young Entrepreneurs in IT project, founded by the Silicon Valley Community Foundation. The program trained young people in technical knowledge based on Cisco Networking Academy curriculum with IT essentials, along with comprehensive training in entrepreneurship. These educational programs helped youth with the necessary skills to start their own business generating self-employment and job opportunities for others. Within the entrepreneurship component, 31 business ideas were formulated and strategic alliances were made to manage seed capital and implement a percentage of their business ideas. In addition, eight youth were able to form social entrepreneurship and sustainable businesses under the Youth Social Entrepreneurs program and received support for their business ideas from the city of Barcelona, Spain in partnership with organizations Ayuda en Acción, ASHOKA and the Municipality of San Salvador Youth Institute. The Don Bosco Integrated Education Youth Program, operated by the Salesian Savior of the World Foundation, has been providing education and social development services to at-risk children and adolescents. To date, 55,743 youth from 120 schools have participated in educational programs that complement the formal education system in El Salvador. Included in the program is access to a center for youth in need of extra family support, a school of the arts, which includes a music club and chamber orchestra, a school of theater and painting and a sports center. The goal is to help youth apply skills they learn at school in a community setting. The different educational programs teach leadership and problem-solving skills as well as communication and teamwork, which help to prevent violence. The School of Rehabilitation Sciences at Don Bosco University in San Salvador contributes to the rehabilitation and inclusion of persons with disabilities through professional training in the field. Training standards meet those set by the World Health Organization and the International Society for Prosthetics and Orthotics. Students graduate with the necessary competencies to provide quality orthotic and prosthetic devices that allow persons with physical disabilities to improve their ability to function and reintegrate into society. FUSALMO, a Salesian-run organization, works to address the root causes of poverty, inequality and violence and gives youth a chance for a better life in their own communities. Conditions of poverty and violence have driven many families to send their children out of the country along dangerous routes north to reach the U.S. border in search of safety and educational opportunities. Families often feel this journey is less risky than what their children face at home. Through FUSALMO’s Don Bosco Youth Integral Program, 55,000 youth benefit from three sports centers developed in Soyapango, San Miguel and Santa Ana. The sports centers offer youth a safe space to connect with their peers and supportive adults while accessing training on creating a culture of peace, vocational guidance, adapted physical education, sports, technology, labor, culture and other topics. In Soyapango, near the outskirts of San Salvador, the 35-acre multi-sports complex includes three basketball courts, a football stadium with an Olympic running track, soccer pitches, an auditorium, a multi-functional hall and video and information technology studios. Students enjoy playing, as well as training courses in various sports, leadership and information technology. Salesians run the facilities, which were financed by the governments of Spain and El Salvador. In addition, since 2013, Don Bosco University and Save the Children have been offering complementary education to youth in 72 educational centers in Sonsonate, Ahuachapán and La Paz. The goal of the “Formarte Joven” program for youth is to build a culture of peace and prevention of violence. As part of this program, nearly 4,500 youth have attended workshops focused on creativity, conflict management, interpersonal relations, leadership development activities, and more. The first workshops were in art, painting, color theory and modeling in resin. Nearly 80 percent of students enrolled in one program also enroll in a second. Salesian missionaries aimed to train an additional 1,400 youth in 2016. Started in 2013 through a $1 million grant from the Social Fund for the Development of Japan and administered by the World Bank, the Don Bosco Youth Symphonic Orchestra and Chorus was begun as a way to address the rising rates of youth violence in San Salvador, El Salvador and has since become a vital resource for youth living in the area. Close to 1,000 young people who live in violent, gang-infested, crime-ridden areas of San Salvador have turned to the Don Bosco Youth Symphonic Orchestra and Chorus as an alternative to becoming involved in local conflict and violence. The Don Bosco Youth Symphonic Orchestra and Chorusperformed free concerts to packed venues, including The Kennedy Center and the World Bank, during its first North American tour. The Salesian-run Don Bosco University, located in San Salvador, works to provide opportunities for advanced education and employment for disadvantaged women. The university is one of the most prestigious institutions of higher education in the country, particularly in the technical and technological sector. In the past, the technology programs were attended mainly by young men but in 2013 the university started an initiative called the Science Camp for Girls, which is supported through funding from the United States Agency for International Development. The Science Camp is a long-term project for the university. To date, 123 young women in their last year of high school have participated in the camp. Young women who have finished school, are convinced they can do well in the technical and science fields and are passionate about this study are encouraged to enter the program for higher learning. At-risk children, youth and their families all have access to better nutrition thanks to an ongoing partnership between Salesian Missions and Feed My Starving Children. The donated rice meals ensure students receive proper nutrition and a balanced diet in order for them to focus on their studies as well as extracurricular activities such as art and sports. Salesian missionaries began school feeding programs to meet the needs of the many area families with limited resources to feed their children. Students at the Don Bosco Industrial Polygon Foundation benefited from one recent shipment. 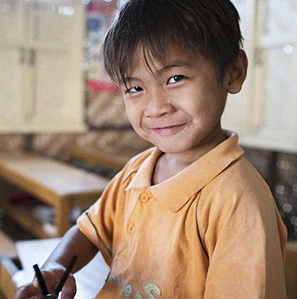 There, more than 700 at-risk children and older youth access free education through the Salesian kindergarten, elementary and high school as well as the Don Bosco Technical Training & Business School. The soy-rice meals were also shared with adults and the elderly living in poverty in the communities. Another shipment was shared with youth in programs with the Laura Vicuna Pro Education Foundation in San Salvador. The children attend the local Salesian school operated by the Salesian Sisters of Mary Help of Christians. Many of the children who received the food donation have parents who are farmers, laborers, and traveling salespeople. These individuals make a very meager living and are unable to have enough food to feed their families. Don Bosco University in San Salvador received the 275 chairs it needed to turn two classroom lecture halls into auditoriums thanks to a recent donation made possible by an ongoing partnership between Salesian Missions and the Institution Recycling Network (IRN), an organization that matches surplus items with organizations and people who need them. The donation by IRN provides seating for two new auditoriums, one seating 175 people and the other 100. The auditoriums have new floors, new glass doors and windows, new ceilings, a fresh coat of paint on the walls and air conditioners. The space is utilized for classes and events. The University has received donated items from IRN in the past, including a shipment of new school and office furniture last year that improved working and learning environments for students and faculty. The Association of Salesian Students for Thought and Civic Education (AESPEC) and the Salesian Association of Students of Aeronautics (ASEA) at the University of Don Bosco in El Salvador recently launched Without Barriers initiative. Without Barriers promotes the social integration of hearing impaired students within the university. The first step was the development of a course in American Sign Language (ASL). This course has been made available to the entire university population including students, teachers and staff. To date, nearly 200 people have already enrolled. According to the representatives from both Salesian associations, there are hearing impaired students attending Don Bosco University who sometimes cannot count on someone to help them communicate with other people, and so it is difficult for them to engage in certain activities inside the school’s campus. The goal of the initiative is to work towards greater inclusion of all students to be able to participate fully and engage campus life. Inspired by the motto, “Speak with your hands and make the difference” Salesian students engaged in the project created a mascot, a monkey that covers its ears with its hands, named Phill, who represents the project’s message. Secondo Juan Villalobos, a mechanical engineering student at the university with hearing disabilities and one of the facilitators of the course, noted that Without Barriers is an excellent way to integrate deaf people in society and enable others to communicate with them.